In just under two months Russia’s increasingly diverse opposition movement has held three larger-than-expected rallies in the center of Moscow. Each one has defied expectations. The first, held one week after disputed parliamentary elections on December 4, was the largest demonstration since the collapse of the Soviet Union and drew an estimated 50,000 people onto the streets. The second, held two weeks later on December 24, was twice as large and seemed to solidify the opposition’s presence—they could no longer simply be brushed off as stooges of the West or a vocal, but inconsequential minority. The third rally, held on February 4, was by some estimates even larger, sub-zero temperatures notwithstanding, and brought together a broad cross section of the Russian electorate, from nationalists and liberal democrats to Communists and the self-declared non-political. Meanwhile, a number of smaller rallies have been staged across the country in industrial cities and small towns. The longevity of the movement, and its ability to weather the strength and pressure of the state, has been doubted from the moment it emerged. Protesters have been dismissed as upper-middle-class upstarts—“office plankton” as they’re known in Russia—with comfortable jobs and good salaries. Once the novelty of the protests had worn off, the reasoning went, the apolitical post-Soviet generation would go back to their cubicles, Putin and the Kremlin elite could get back to the business of running the country, and the Russian winter would be forgotten. But, of course, that hasn’t happened. If anything, the protesters have upped the ante, insisting that parliamentary elections be repeated as well as vowing to ensure that presidential elections in March are as free and fair as the current system allows. Vote-rigging is nothing new in Russia nor has it been limited to the Putin era. Indeed, Boris Yeltsin’s 1996 reelection campaign and victory, in which millions of votes were “miscounted” and widespread electoral fraud was committed, probably exceeds any of the machinations of the current regime. So the issue isn’t the scale of the fraud but rather the response to it. The Internet has certainly helped to expose more outright acts of manipulation, such as regional governors appointed by the Kremlin threatening to withhold funding from organizations whose members do not vote for Putin’s United Russia party, in addition to giving citizens a public forum to air their grievances and document abuses of power ignored by the largely state-run media. The parliamentary elections simply served to strip the veneer off of what Andrew Wilson calls the “virtual politics” of the post-Soviet world. The system that has allowed Putin to rule unchallenged for more than a decade has suddenly been upended. What will follow is far from certain. lack a political organization or mechanisms to convey their demands to the government. They welcome journalists, bloggers, and writers as leaders and speakers at rallies, but shun politicians. This rejection of politics reduces their power. But does it? The rejection of politics as such—that is, the stage-managed pseudo-democracy propped up by the Kremlin—has, if anything, strengthened their message and may explain why the protests have gotten larger, not smaller. Politicians in Russia are hardly more popular than the class of oligarchs who turned state-owned resources into private gain at the expense of the large majority of the Russian people. (Putin has, in a way, reversed that trend, but to the benefit of a new class of bureaucratic elites.) To claim that somehow allying themselves with politicians—whether the longtime liberal leader Grigory Yavlinksy or newly-minted “opposition” candidate and billionaire oligarch Mikhail Prokhorov—would help their cause is a clear misreading of what the protest movement hopes to achieve. Their aim is much larger, though it has perhaps not been clearly articulated yet. In addition, the notion that a more formal political organization or party would be able to withstand the power and resources of the Kremlin is also doubtful; most such parties have been discredited, co-opted or marginalized. Part of the movement’s success has come from the fact that it is non-aligned. Indeed by focusing rather broadly on upcoming presidential elections and tapping into widespread discontent with the current political system and deepening corruption the movement will likely continue to grow. In the process, they’ve already won some concessions: the government has said it will make it easier to register political parties, reserve a certain number of seats in parliament for independent lawmakers and restore the direct election of regional governors. Lipman and Petrov also misread the grassroots movements from which the opposition’s leaders—the group does in fact have leaders, just not a single voice—have emerged, describing them as mostly “nonpolitical” affluent Muscovites more interested in charity than self-sacrifice. One of the central figures in helping to organize the recent series of rallies has been Evgenia Chirikova, a young mother and environmental activist, involved in the nearly five-year campaign to protect an old growth forest outside of Moscow. Another is Alexey Navalny, the much written about blogger and anti-corruption activist, who has, through his watchdog website, RosPil, helped to expose abuses of power at the highest levels. A third figure is Sergei Udaltsov, a leader of the socialist Left Front movement, who was detained during the unsanctioned protest on December 5 and imprisoned for a month after a prolonged hunger strike. All are in their mid-thirties and could have pursued very different career paths. In Cairo, young people came to the square ready to sacrifice their safety and, in some cases, their lives. In Moscow, however, the December protests were authorized by the city government, and the police did not rough up or detain anyone [italics added]. That may be true but it doesn’t reveal a lack of commitment. Chirikova, Navalny, Udaltsov and others have all participated in unsanctioned rallies and been arrested, in some cases beaten, and threatened with violence. Given the circumstances, the fact that the rallies have been staged in a highly organized and peaceful manner, often with a strong dose of dark humor and playfulness thrown in, reflects a high level of discipline and forward thinking. Of course it’s impossible to know how many people would have shown up if the rallies had not been authorized or what the response of the riot police would have been. It is a measure of their strength that activists have succeeded in staging such large protests while avoiding direct confrontation with riot police, which would surely have been used by the Kremlin as an excuse to crackdown. 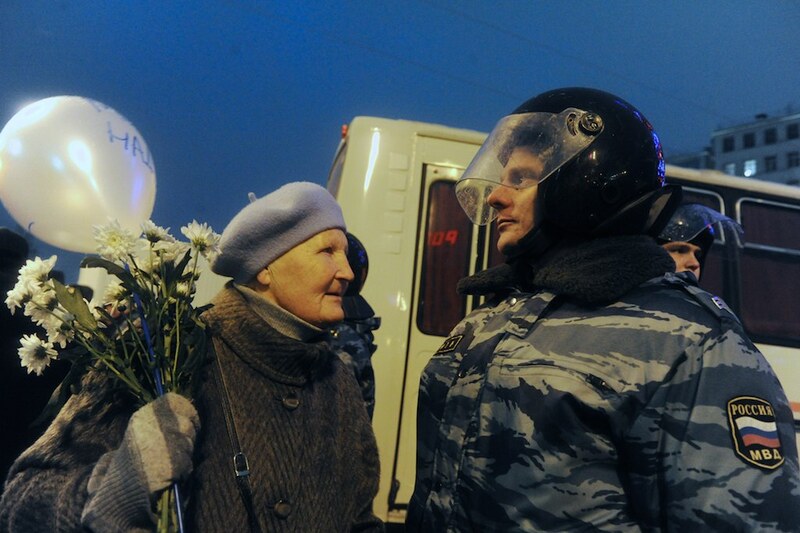 One of the more widely-circulated images from the December 10 protests was of a riot police officer holding a white flower, the olive branch of the protests, behind his back. But the opposition movement’s greatest test will be how it responds to presidential elections in early March and the all but certain outcome of another six-year term for Vladimir Putin. There is already talk of early elections being held in 2014, the dismantling of the ruling party and the end of the Putin/Medvedev tandem. It appears that Russia’s long winter of discontent has only just begun. The author is either propagandzing or is genuinely ignorant of the politics of the rallies on Feburary 4th as they were two SEPARATE rallies – the original anti-Putin rally and a second rally that dwarfed the anti-Putin pro-West rally. If anything, the rally on February 4th helped to bolster Putin’s electoral chances and strengthen his hold on Russian politics. Again, the author is either propgandizing or is ignorant. Sorry, but I think it is the former. Here’s a link to a better, more accrately written article. Adam mentioned that there was a pro-Putin rally on February 4, in the original post and as the editor I removed it, because I wasn’t aware that it was larger or so significant. So blame that on my ignorance. Also it doesn’t seem fair to discount the rest of the piece because of that one omission. Is there anything that he actually said that you think is off the mark? Is the anti-Putin movement not strong and growing?